(Bloomberg) -- FedEx Corp. tumbled as a new cut to its earnings outlook stoked Wall Street concerns over the courier’s ability to navigate a global slowdown and cash in on surging e-commerce. Overseas demand is softening amid U.S.-China trade tensions and uncertainty over the U.K.’s exit from the European Union, FedEx said as it reported earnings. More surprising was weakness at the company’s U.S. ground business, which struggled with higher costs from harsh winter weather, the shift to a six-day delivery schedule and an increase in less profitable residential shipments. The rising hurdles at home and abroad are piling on pressure as FedEx Chief Executive Officer Fred Smith works through a surprise management revamp. Chief Operating Officer Raj Subramaniam last month replaced David Bronczek, who also stepped down as a director just weeks after joining the board. Separately, the head of FedEx’s overnight air-freight division -- its biggest business -- retired in December. FedEx fell 5.6 percent to $171.21 at 10:35 a.m. in New York. The shares had risen 12 percent this year through Tuesday in New York, recovering some ground after a 35 percent plunge in 2018. 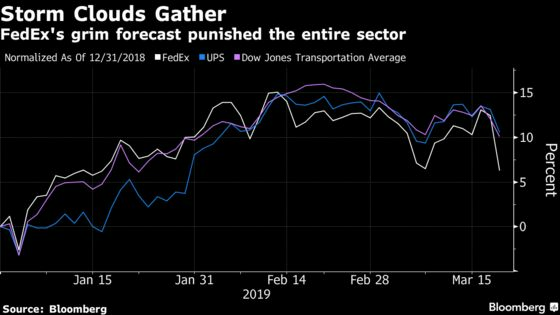 Last year’s drop was FedEx’s biggest in a calendar year since 1987, and almost twice as much as United Parcel Service Inc.’s decline. If the business slowdown continues, FedEx is poised to implement new cost cuts by paring network capacity, reducing worker hours, modifying aircraft deliveries and adjusting investment plans, said Chief Financial Officer Alan Graf. The Memphis, Tennessee-based company already announced a U.S. employee buyout in December that’s expected to save as much as $275 million in 2020. FedEx had anticipated revenue would increase by $6 billion for the year ending in May but will end up with only a $4.5 billion increase, Smith said. Adjusted earnings for the fiscal year ending in May will be $15.10 to $15.90 a share, down from a previous forecast of $15.50 to $16.60, FedEx said in a statement. The outlook excludes expenses for integration, lawsuits, employee buyouts and other items. As recently as September the company had projected as much as $17.80. Profit for the quarter ending Feb. 28 fell to $3.03 a share, trailing the $3.12 average of analyst estimates compiled by Bloomberg -- a number that had fallen 10 cents since mid-January. Sales climbed 3 percent to $17 billion, compared with expectations of $17.7 billion. The ground business posted operating income of $577 million for the quarter, well short of an estimate of $763 million by Jack Atkins, an analyst at Stephens Inc. The result was unexpected, especially after FedEx spent heavily on the ground network to drive down costs and offer new services to customers to gain market share. “It is somewhat disappointing that we have yet to see the benefits of the significant investments made over the past several years begin to drive improving margin performance in this business,” Atkins said. FedEx purchased TNT Express in May 2016 for $4.8 billion to expand in Europe. Plans for integrating the company were knocked off kilter when a global cyberattack in 2017 caused customers to drop the service. FedEx on Tuesday said integration costs for the acquisition are expected to exceed $1.5 billion through fiscal 2021, and additional costs may be incurred. The integration efforts are starting to pay off, said Subramaniam. The company can now put FedEx Express packages onto TNT’s ground-transportation network, which lowers costs and improves transit time by an average of one day on 40 percent of European lanes, he said. “I want to emphasize that we are not waiting for integration to complete to add value for our customers,” Subramaniam said.